2004 Ducati Supersport 1000 DS. Picture credits - Ducati. Submit more pictures. Color options: Metallic grey. Red wheels with metallic grey fairing.Tank: Red, yellow, metallic grey. Comments: The King of the class, the Supersport 1000 boasts a 992 cc Dual Spark engine and state-of-the-art suspension components making it the most advanced Supersport ever made. Its signature Ducati trellis frame and 992 cc Dual Spark engine guarantee confidence-inspiring stability and torque-filled power. Ask questions Join the 04 Ducati Supersport 1000 DS discussion group or the general Ducati discussion group. Get a list of related motorbikes before you buy this Ducati. Inspect technical data. Look at photos. Read the riders' comments at the bike's discussion group. And check out the bike's reliability, repair costs, etc. 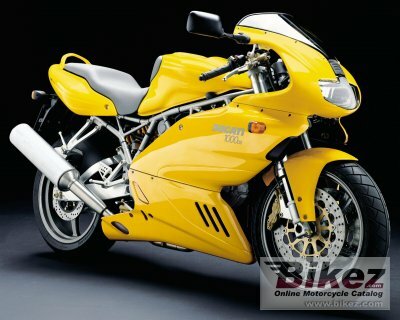 Show any 2004 Ducati Supersport 1000 DS for sale on our Bikez.biz Motorcycle Classifieds. You can also sign up for e-mail notification when such bikes are advertised in the future. And advertise your old MC for sale. Our efficient ads are free. You are also welcome to read and submit motorcycle reviews.